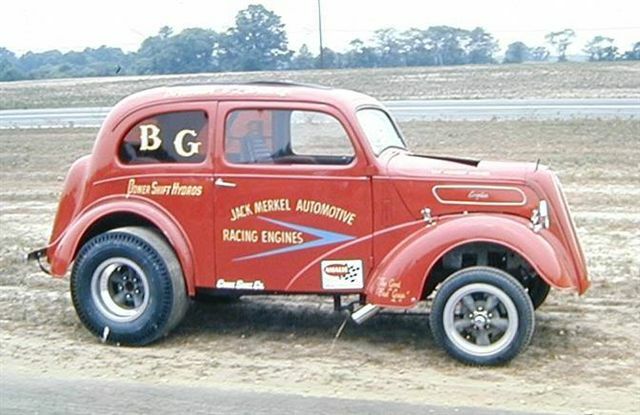 Jack Merkel’s small-block Chevy with Hilborn fuel injection powers the perfectly replicated ’48 Anglia B/Gasser of “Coney Island Ralph” Landolfi. Ralph, seated behind the car, watches over the flawlessly recreated “Eastwind III” during the York U.S. 30 nostalgia event in 2004. East Coast drag racing fans and in particular, Gasser fans recently lost a legend with the passing of “Coney Island Ralph” Landolfi, a 2004 inductee in the East Coast Drag Times Hall of Fame. Landolfi died January 7, 2016, in Colts Neck, New Jersey, following a lengthy battle with complications from diabetes. At the time of his passing Ralph Landolfi was 81 years old. Ralph Landolfi, owner of Landy’s Performance, first gained regional and then national prominence in the 1960’s as the builder and driver of several premier Gassers. His first notable Gasser success came with a 1955 Chevy sedan. That was followed by a 1940 Willys coupe and finally, two different ’48 Anglia B/Gassers. Landolfi’s cars always ran extra-hard, and for a time in 1966 he held the NHRA B/Gas National Record. Coney Island Ralph lived in New Jersey, but was a native of Brooklyn, New York. Like many NYC area guys, Landolfi began drag racing on the streets until graduating to a “real race car”, his ’55 Chevy C/Gasser. He later built the ’40 Willys, running the Chevy powered car in B/Gas, followed by his famous, red 1948 Anglia B/Gas sedan. His career as a car builder and racer was also predated by a stint of building and riding a nitro-fueled, Harley-Davidson motorcycle. Landolfi’s Harley was known to be both fast and quick, and on occasion, he found himself running for Top Eliminator at the New York tracks he frequented. Before he became totally immersed in drag racing, Ralph tried his skills at area short tracks where he was a successful dirt circle track racer. A photo from long-ago hanging on Ralph’s office wall showed him proudly holding the traditional checkered flag after a circle track victory. “Coney Island Ralph” built this mid-10 second, B/Gas ’48 Anglia. Famed Long Island engine master Jack Merkel built the Hilborn-injected, small-block Chevy engines. This car was destroyed in a crash at New York National Speedway. Luckily, Landolfi escaped with only a broken arm. Landolfi’s first ’48 Anglia, “Eastwind”, was destroyed in a spectacular accident at New York National Speedway. An errant tow car cut in front of Landolfi in the shut-down area just as he was braking from a 130 mph run. With no exit available, Ralph t-boned the car, flipping the Anglia and totaling it. He was fortunate to escape the scary crash with just a broken arm. The injury ended his driving for a while but led to him helping fellow racer “Jersey John” Anzelmo get his F/Gas ’55 Chevy running below existing NHRA class records. Ralph built a successor to his Northwind Anglia, this time another ’48 Anglia, but with a chopped top. 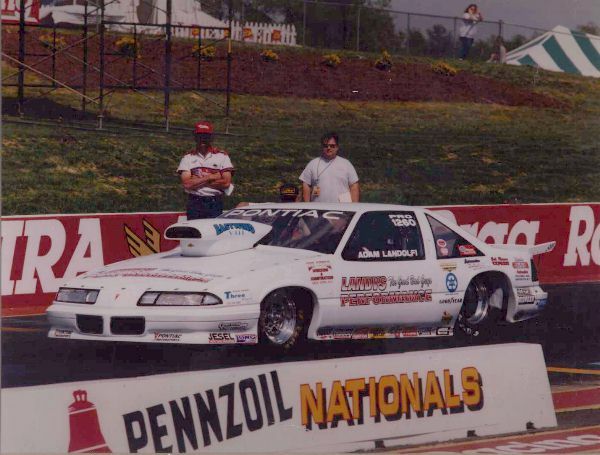 That car was painted white and like its predecessor, also ran in NHRA’s B/Gas class, or in C/Altered, depending on which Eliminator Ralph chose to compete in that race day. 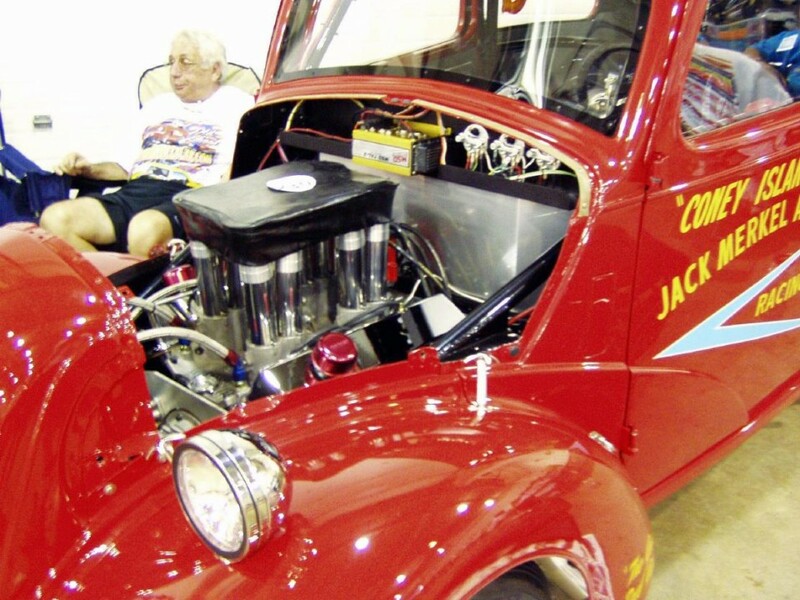 Ralph Landolfi was close friends with famed supercharged Gasser legend, Jack Merkel. Merkel’s legendary skills as an engine builder and tuner found his customer cars at one time holding NHRA’s much-coveted A, B and C/Gas Supercharged class records! Coney Island Ralph was also a customer of Merkel’s engine building shop and displayed Merkel’s name on his cars. 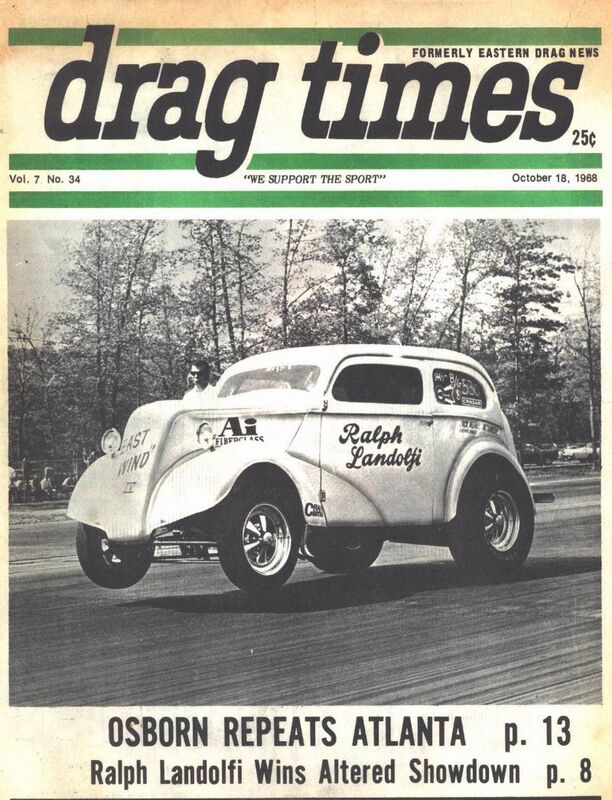 Drag Times featured Coney Island Ralph Landolfi’s famous chopped-top, ’48 Anglia B/Gasser on this October, 1968 issue’s cover. This Chevy powered Anglia was the replacement for Ralph’s first B/G Anglia that was destroyed in a crash. Landolfi’s friend “Jersey John” Anzelmo now owns this car. At home, Ralph Landolfi’s son Adam grew up shadowing his dad, both in the garage and then at the race track. Adam was an apt pupil and began his own drag racing career after learning from one of the best and best-known racers on the East Coast, his dad. Adam Landolfi also enjoyed a successful racing career of his own until his life was cut short in early 2007 by an untimely heart attack. Adam was just 42 at the time of his death. The loss of his only son was not surprisingly, an unexpected tragedy that Ralph never quite recovered from. In 1967 Ralph Landolfi stepped away from Gassers briefly when he drove the unique 430 Buick powered, Skylark nitro Funny Car built by Jerry Lipori and Steve Malise. It was Malise who built the Logghe-copy chassis and secured sponsorship by Mid-County Buick Dealers of Brooklyn, NY. The fiberglass body was built by Ron Pelligrini, who made a second body and ran his own Skylark FC, but with 426 Hemi power. Ralph made several passes in the “Ingenue” car during its early life before abandoning the driver’s seat to other drivers. A blown big-block Chevy soon replaced the fragile and unsuitable 430 Buick engine. The car was eventually parked due to lack of funding to compete with its contemporaries. After that brief distraction with the Buick Funny Car Ralph “returned home” to his first love, racing Gassers. He ran both Street Eliminator (later renamed Modified) and with the Anglia classified as C/Altered, in Competition Eliminator. The cash pay-out for Comp was often greater, and many Gasser racers made the jump successfully to Comp Eliminator. Ralph Landolfi and his son, the late Adam Landolfi, ran Pro/Stock until costs made it impossible to remain competitive without major sponsorship funding. Adam drove the 500 CID, big-block Chevy powered Pontiac. During his career Coney Island Ralph earned the respect of his fellow racers and drag racing fans for his hard-charging Gassers, Altereds, and later Pro/Stock. With Adam driving the Pro/Stock car the team ran competitively until the huge costs of Pro/Stock racing forced them to abandon the effort. After that they put together several different Super Stock and Stock class cars, all with solid performances. Ralph also enjoyed a brief yet notable career as the throttleman for John Betts’ Long Island based McBetts Engines offshore race boat. A few minutes in heavy seas in a 100 mph offshore boat can convince even the toughest hombre that offshore racing is not for them, but Landolfi thrived as he balanced the multi-engine power in and out of waves. Landolfi later built a pair of 1934 Ford street rods, a roadster and a Phaeton. Both cars reflected Ralph’s obsession with detail, and they received well-deserved awards and trophies for their flawless craftsmanship. In 2004 “Coney Island Ralph” Landolfi was inducted into the East Coast Drag Times Hall of Fame. Ralph’s family, including his son Adam was on hand to witness his entry into the Hall of Fame. It was a highlight to his lengthy career as a top-flight drag racer and competitor. Saturday, during the 2004 Hall of Fame car show in Henderson, North Carolina, Coney Island Ralph’s recreation of the famed record setting ’48 Anglia B/Gasser was on display. Ralph spent all day with the car, posing for photos and answering questions from the hundreds of people who stopped to view his handiwork and ask about the days when Gasser racers were major drag racing heroes. On Sunday, while he was being inducted into the Hall of Fame, the Anglia sat outside, its bright red colors gleaming in the October morning sunshine. Inside, at Vance-Granville College auditorium, Coney Island Ralph Landolfi accepted his Hall of Fame plaque and thanked everyone with the dignity, grace and finesse that defined his racing career and life. In the audience were Ralph’s wife Barbara and his son Adam Landolfi. All wore broad smiles. Next Next post: 2016 Hall of Fame Weekend Oct. 14-15-16 Will Be Bigger and Better!